While the book does go a long way towards explaining what happened, Michael Lewis, a gushing Obama, supporter, goes out of his way to absolve Federal government culpability for any part of the crisis. It is a glaring omission that casts a stain on an otherwise excellent book. Mortgage Bond - A claim on the cash flows from a pool of thousands of mortgages. Problem with Mortgage Bonds - The borrower typically refinances when mortgage rates fall and repays the mortgage early. This sticks the bondholder with a pile of cash that can only be invested at lower rates. Solution for Mortgage Bond Problem - Salomon Brothers carved mortgage bonds into tranches. Buyers on the ground floors got hit with the earliest repayments and, in turn, received a higher interest rate. Each tranche or floor received successively less interest and were at lower risk to be impacted by early repayments. Prime Mortgage Bonds, Biggest Fear = Early Repayment - The biggest fear of the early mortgage bondholder was early repayment not default since these bonds were designed to fall under the standards required to be guaranteed by one of the government agencies; Freddie Mae, Fannie Mai, Ginnie Mae, ect..
Sub prime, a Point of No Return - A sea change occurred when Mortgage Bonds began being marketed to less creditworthy borrowers who did not qualify for government guarantees, not so they could buy a house, but so that they could cash out whatever equity they had in a house that they already owned. Sub prime Mortgage Bonds, Biggest Fear = No Repayment - Instead of fearing early repayments, bondholders of Sub prime mortgages most feared no repayment at all since these loans did not qualify for government guarantees. Solution for Subprime Mortgage Bond Problem - Instead of receiving higher interest rates for assuming the risk early repayment bondholders on the ground floor received higher interest payments for assuming the risk of default. Each tranche or floor received successively less interest and were at lower risk to be impacted by default. Initial Impact of the Model on Society - It allowed lower middle class Americans to substantially increase their debt because of the lower interest rates charges. It dumped this debt in the laps of middle class savers in the form of highly risky bonds that were rated as low risk by the credit ratings agencies. It also dumped these liabilities on the investing public in the form of equity sold on these risky companies that originated this debt. Problems with Sub Prime Mortgage Agencies - These companies tended to only disclose their ever growing earnings, but not much else like their ever growing delinquency rates. These agencies claimed that the delinquency rates did not matter to them because they sold off these loans quickly to companies that packaged them into bonds. This was not exactly true. These companies held on to a small proportion of the loans that they originated yet under accounting rules could report them on their books under the assumption that none of them would be repaid early. 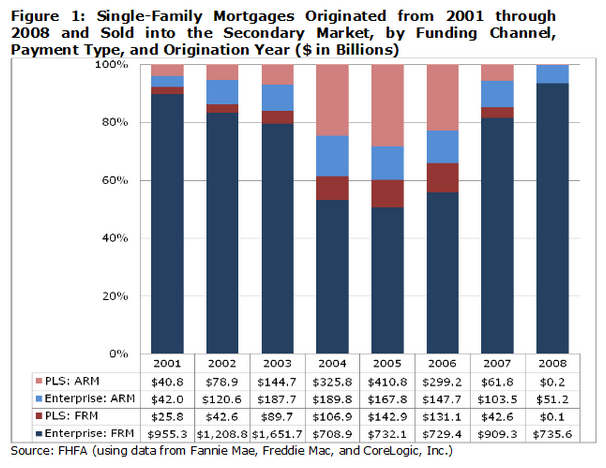 A Ponzi Scheme - Like all good Ponzi schemes, these sub prime mortgage agencies were able to hide their lack of earnings via shady accounting and a high growth rate fed by a flood of capital into this sector of the market. Household Finance Company - One of the most successful of the early companies to start marketing second mortgages to non-credit worthy individuals was Household Finance Company. It owed a large part of its success by deceptively selling 15 year mortgages as thirty year mortgages with deceptively high interests rates. In a sign of how nonchalant the regulators were to these abuses, it was a large class action settlement not government action that eventually led to management selling out (to their great gain) to HSBC in 2003. Teasers - Unlike other subprime loans, subprime mortgage loans were marketed as beneficial to the lower middle class. They were marketed as allowing one to consolidate all ones other debts such as credit card debts at a low rate. The problem was that this low rate was often a short term teaser rate. No Equity Homes/Glorified Rentals - Low to no down payment mortgage loans to low income borrowers with reduced mortgage insurance requirements due to over appraisals and faulty recasting of loan risks all conspired to exponentially increase the threat of default at the slightest downturn. If these trends remain in place, it is likely that the home purchase boom of the past decade will continue unabated. Despite the increasingly more difficult economic environment, it may be possible for lenders to further ease credit standards and more fully exploit less penetrated markets. Recently targeted populations that have historically been denied homeownership opportunities have offered the mortgage industry no hurdles to overcome. Industry participants in combination with eased regulatory standards and the support of the GSEs (Government Sponsored Enterprises) have overcome many of them. Setting the Fuse with ARMs (Adjustable (Variable) Rate Mortgages - Not only were loans being extended to people who were at a high risk of default (sub-prime borrowers) but an ever increasing percentage of the loans were made as ARMs (Adjustable Rate Mortgages) which virtually ensured a wave of defaults once interest rates began to rise. A New Loan Origination Model - If subprime financiers learned one big lesson the crash of the late 90's, one would think that it would have been NOT to make these toxic loans. Instead they learned a more devious lesson, they learned that they needed to dump these loans onto others as soon as possible. Some think that this pump and dump model is one of the main reasons underlying the housing bubble and subsequent collapse. Originate to Hold - This is the traditional business model for mortgages. One where a local institution received deposits from customers and loaned this money out for things like mortgages after a careful assessment of the risks and valuation of the assets that will be accepted as collateral. Since the bank held these loans on their balance sheet, they had a vested interest in making sure that the loads prudently extended and actively monitored. Originate and Sell Model (Pump and Dump) (OTD - Originate to Distribute) - This is the new model for mortgages. One where loans are granted by a bank or other loan originator and quickly sold off to Wall Street to be packaged and sold to investors as bonds. Under this new model, the loan originator had no real vested interest in prudently extending loans and/or monitoring them. They were mainly after the fees and commissions that they would get by making these loans. Since they would quickly dump these loans to Wall Street, they only needed to make sure that they met whatever minimal requirements of the people buying the loans. 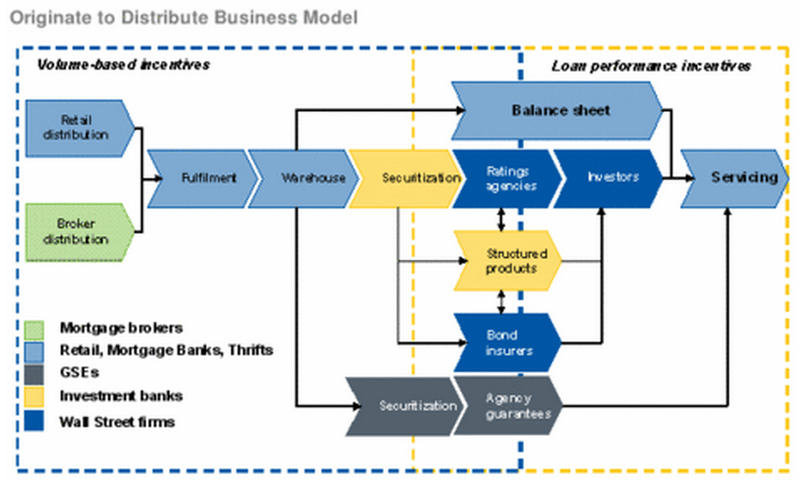 Bank credit has evolved from the traditional relationship banking model to an originate-to-distribute model. We show that the borrowers whose loans are sold in the secondary market underperform their peers by about 9% per year (risk adjusted) over the three-year period following the initial sale of their loans. Therefore, either banks are originating and selling loans of lower quality borrowers based on unobservable private information (adverse selection), and/or loan sales lead to diminished bank monitoring that aﬀects borrowers negatively (moral hazard). In 2010, global stock market capitalization stood at $54 trillion,according to the McKinsey Global Institute’s report “Mapping Global Capital Markets 2011.” The outstanding global debt including public debt securities, financial institution bonds and nonfinancial reached $93 trillion -- almost twice the capitalization of the equity market. The bond market is not limited to corporations, other entities such as governments can issues bonds. Most investors are older and more risk averse so they prefer fixed payments. The bond market lends itself to innovation such as the securitization of mortgages. One reason that the general public has the wrong perception about the relative size of the stock and bond markets is that it servers the interests of large corporations to have the public focus on bonds. In general, bond holders are in it for the long term not speculation. Since commissions are a large source of income for brokerages, it is in their best interest to shift the media focus on stocks in order to generate churn.